Gorilla Playsets is counted among the top most brands of playground equipment. They have been serving the customers with ready to assemble play sets since 1992. Their play sets meet the safety measures and defined standards, therefore, families choose to install Gorilla Playsets equipment in their backyard. These play sets keep the children active and fit. The company specializes in offering ready to install play sets. These are supplied with 3-D illustrated instructions, which are easy to follow. You can assemble the equipment in just a few minutes with the help of basic household tools. They design their play sets and its accessories in accordance with American Society for Testing and Materials (ASTM) standards and specifications. Gorilla Playsets equipment is coated with maintenance-free Timber Shield protective poly coating and does not get faded under the sun. Besides, the company makes use of heavy duty hardware like electro-galvanized 5/16" and 3/8" diameter hardware for enhancing the strength and stability of their play sets. For non-structural components, they use electro-galvanized wood screws instead of nails to improve its durability. This brand provides one-piece injection molded swing sets accessories to the customers. These accessories contain UV inhibitors, therefore, it does not fade or heat up in the direct sunlight. Besides, they are always ready to lend a helping hand to the customers, whenever required. 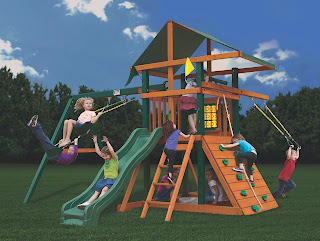 You can also buy Gorilla Playsets' outdoor playsets from Playgrounds.net at reasonable prices.